It has been a while since I have posted pics of my precious doll. 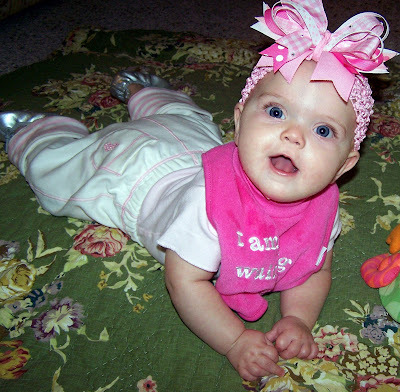 Here are just a few sweet pics of my beautiful baby girl. Isn't she is such a big girl!! Also...I thought I would post a few of her in her costume. 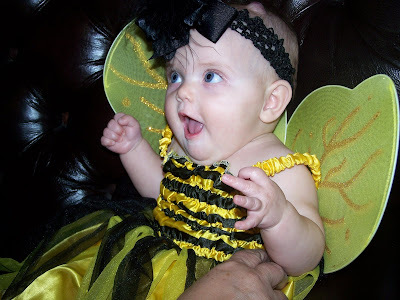 She was the sweetest little bee ever and she wore her costume all around town on Halloween to shop with Mama. And...What bee wouldn't be complete without a big bee bow?? Life is good and being her mama is even better. Oh my goodness, she is such a DOLL!! That bee costume is so cute!! Our little babies are growing up too fast!! Hope you are doing well, we miss you up here at Pecan Creek!! she is so stinkin' cute! i love those eyes! 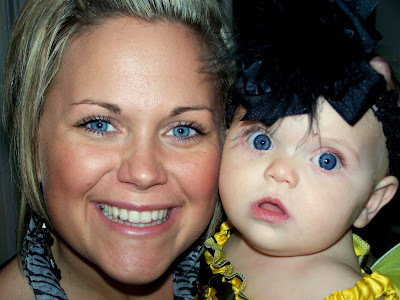 look at both of your beautiful blue eyes! I love reading your blog!